NEW YORK (AP) — Gwynne Wilcox jokingly calls herself a duchess because she celebrates all things Meghan Markle. NEW YORK (AP) — Flowers from Meghan Markle's New York baby shower are getting a second life. WELLINGTON, New Zealand (AP) — Prince Harry and wife Meghan broke news they're expecting their first child during their 16-day tour of Australia and the South Pacific. ROTORUA, New Zealand (AP) — Prince Harry and wife Meghan examined the navel, nostrils and whiskers on New Zealand's flightless kiwi bird and got to name two tiny chicks on the final day of their 16-day tour of the South Pacific. 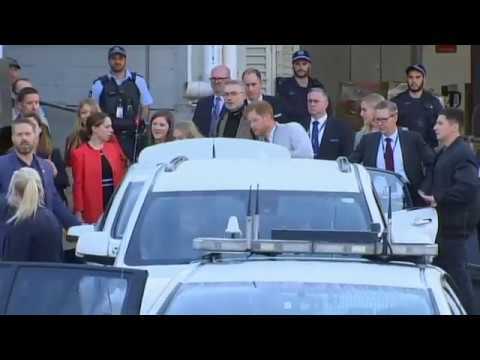 SYDNEY (AP) — The Duke and Duchess of Sussex took separate boats Monday to Queensland's Fraser Island as their tour of Australia and the South Pacific continued with a reduced schedule for the pregnant duchess. SYDNEY (AP) — Prince Harry paid tribute to Australian service members by opening a new wing of a war memorial on Saturday before opening the Invictus Games as he and wife Meghan continued their visit to Australia and the South Pacific. SYDNEY (AP) — Prince Harry scaled the Sydney Harbor Bridge on Friday to raise a flag marking the arrival of the Invictus Games, his brainchild and the focus of his current royal tour of Australia and the South Pacific. DUBBO, Australia (AP) — The Duke and Duchess of Sussex were jokingly thanked for bringing England's notoriously inclement weather to a drought-stricken Outback town on Wednesday in a rain-drenched visit to Dubbo during their Australian royal tour. SYDNEY (AP) — A beaming Duke and Duchess of Sussex thrilled thousands of fans outside the Sydney Opera House on Tuesday during their first meeting with the general public since the former Meghan Markle's newly announced pregnancy. International visitors to Buckingham Palace to see the popular Changing of the Guard ceremony have reacted with joy to the news that Prince Harry and Meghan, Duchess of Sussex, are expecting their first child. A 29-year-old Canadian tourist Braden Fraser from Toronto said that "it's wonderful."